For the little ones who can't tie there shoe yet. Replaces ribbon ties and changes the shoe to a slip on. 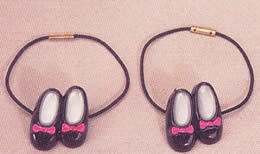 Elastic cord with novelty button for quick and easy shoe fastening. Great with Economy Tap Shoes or Mary Jane Tap Shoes!